Letter Quality 24 x 36 Characters per Sec. 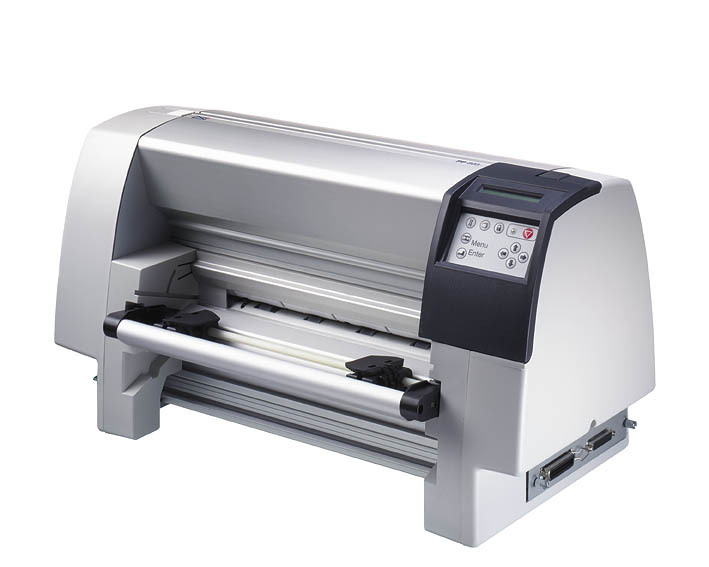 The PP 803C is a 92 column (at 10 CPI) Serial Dot Matrix impact printer specifically designed to meet the rigid requirements of printing "on demand", transactional documents, day in and day out. Document types include invoices, shippers, medical forms, hazardous waste manifest, etc. Rugged heavy duty construction provides for years of reliable operation to run large volumes (40,000 pages per month) of up to nine (9) part forms (equivalent to 360,000 pages per month on a laser or ink jet). Two tractor paper paths and the resident one million page cutter allow alternate demand printing of two different forms without operator intervention. Pinch roller paper movement, sensor monitored for position and firmware controlled, provides superior vertical registration even when "demand" switching forms between tractors. "Demand" cut forms can be routed to the front catcher tray (replaces the top tractor) for easy user access to the completed form. This feature is ideal when access to the rear of the printer is limited, as in under-the-counter retail or ticketing operations. A paper slew rate of 20 inches per second allows the user fast paper access when there is low vertical print density (as in printing one or two line item invoices on letter size paper). Proprietary printhead/printing technology provides 600 character per second draft printing and 300 character per second near letter quality printing without proportionate decrease in actual throughput. This innovative printer provides complete solutions for applications that heretofore have only been partially resolved.